حاتمی, جواد, پژمان فرد, مینا, صالح نجفی, مهسا. (1392). رابطهٔ باورهای هوشی، هدف های پیشرفت و تعلل ورزی تحصیلی در بین دانشجویان دانشگاه تهران. نشریه پژوهش در نظام های آموزشی, 7(21), 57-70. جواد حاتمی; مینا پژمان فرد; مهسا صالح نجفی. "رابطهٔ باورهای هوشی، هدف های پیشرفت و تعلل ورزی تحصیلی در بین دانشجویان دانشگاه تهران". 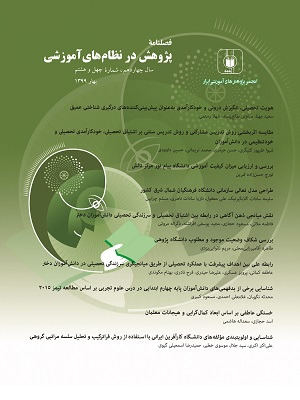 نشریه پژوهش در نظام های آموزشی, 7, 21, 1392, 57-70. حاتمی, جواد, پژمان فرد, مینا, صالح نجفی, مهسا. (1392). 'رابطهٔ باورهای هوشی، هدف های پیشرفت و تعلل ورزی تحصیلی در بین دانشجویان دانشگاه تهران', نشریه پژوهش در نظام های آموزشی, 7(21), pp. 57-70. حاتمی, جواد, پژمان فرد, مینا, صالح نجفی, مهسا. رابطهٔ باورهای هوشی، هدف های پیشرفت و تعلل ورزی تحصیلی در بین دانشجویان دانشگاه تهران. نشریه پژوهش در نظام های آموزشی, 1392; 7(21): 57-70. اساسی، حسین( 1390). بررسی نقش میانجی ابعاد کمال‌گرایی در رابطۀ ابعاد فرزندپروری و اهمال‏کاری تحصیلی. پایان‏نامه کارشناسی ارشد، دانشگاه شهید بهشتی. حجازی، الهه؛ رستگار، احمد؛ قربان جهرمی، رضا( 1387). الگوی پیش‌بینی پیشرفت ریاضی: نقش هدف‏های پیشرفت و ابعاد درگیری تحصیلی. فصلنامه نوآوری‌های آموزشی، سال هفتم، شماره 28. رستگار، احمد( 1385). رابطه باورهای هوشی و پیشرفت تحصیلی: نقش واسطه‏ای اهداف پیشرفت و درگیری تحصیلی. پایان‏نامه کارشناسی ارشد، دانشگاه تهران. الیس، آلبرت و ناس، ویلیام جیمز( 1382). روان‏شناسی اهمال‏کاری؛ غلبه بر تعلل‏ورزیدن. ترجمه محمد علی فرجاد. تهران: انتشارات رشد. Alexander, E., Onwuegbuzie, A. (2007). Academic procrastination and the Role of Hope as a Coping strategy.Personality and Individual Differences. 42, 1301-1310. Ames, C. ( 1992). Goals, structures, and student motivation. Journal of Educational Psychology, 84, 261-271. Beswick, G., Rothblum, E., &Mann,.L.(1988). Psychological antecedents of student procrastination.Australian psychologist, 23, 207- 217. Braten, I., Stromso, H. (2004). Epistemological belief and implicit theories of intelligence as predictors of achievement goals.Contemporary Educational Psychology, 29, 374- 388. Contemporary Educational Psychology, 30( 1), 43-59. Dupeyrat, C., & Marine, C. ( 2005). Implicit theories of intelligence, goal orientation, cognitive engagement, and achievement: A test of Dweck s model with returning to school adults. Elliot, A. G.( 1999). Approach and Avoidance motivation and Achievement goal.Educational psychologist, 34, 169-189. Elliot, A. J. ( 2005). A conceptual history of the achievement goal construct. In A. J. Elliot & C.S. Dweck (Eds.) Handbook of competence motivation (pp.52- 72). New York: Guilford Press. Elliot, A. J., & McGregor, H.( 2001). A 2*2 achievement goal framework. Journal of Personality and Social Psychology, 80(3), 501-519. Elliot, A., McGregor, H.A., Gable, S.( 1999). Achievement goals, study strategies, and exam performance: A meditational analysis. Journal of Educational psychology, 91, 549- 563. Ellis, A &. Knaus, W. (2002).Overcoming procrastination. New York: New American Library. Ellis, A., &Knaus, W. J. (1997).Overcoming procrastination. New York: Signet Book. Ferrari, J. &Arkadaslari (2007). Examing the Self of Chronic Procrastinators: Actual, Ought and Undesired Attributes. Personality and Individual Differences, 5(2), 115-123. Howell, A.J., & Watson, D. C.( 2007). Procrastintion: Associations with achievement goal orientation and learning strategies. Personality and Individual Differences, 43, 167-178. Kagan, M., Cakir, O., IIhan, T., &Kandemir, M. ( 2010). The explanation of the academic procrastination behavior of university students with perfectionism, obsessive- compulsive and five factor personality traits.Procedia Social and Behavioral Sciences, 2, 2121- 2125. KhezriAzar, H., Lavasani, M. G.,Malahmadi, E., &Amani,. J. (2010). The role of self- efficacy, task value, and achievement goals in predicting learning approaches and mathematics achievement. Procedia Social and Behavioral Sciences, 5, 942-947. Milgram N. A. (1991). Procrastination.Encyclopedia of Human Biology. Vol. 6,( New York, Academic Press) pp.149-155. Milgram, N, Mey- Tal, G., &Levison, Y. ( 1998). Procrastination, generalized or specific, in college students and parents.Personality and Individual Diffrences, 25, 297- 316. Moon, S. M., &IIIingworth, A. J. (2005).Exploring the dynamic nature of procrastination: A latent growth curve analysis of academic procrastination.Personality and Individual differences, 38, 297-309. Pfister, T. (2002). The Effect of Self- Monitoring on academic Procrastination, Self- efficacy and Achievement. The Florida State University College of Education. Florida. Solomon, L. J., &Rothblum, E. D. (1984). Academic procrastination: frequency and cognitive- behavioural correlates. Journal of Counseling Psychology, 31, 504-510. Steel, P.,Brothen, T., &Wambach, C. (2001). Procrastination and Personality, Performance, and mood. Personality and Individual Differences, 30, 95-106. Tice, D., &Baumeister, R.( 1997). Longitudinal study of procrastination, performance, stress, and health: The costs and benefits of dawdling. Psychological Science, 8, 454-458. Watson, D. C. (2001). Procrastination and the five- factor model: A Facet Level Analysis. Personality and individual Differences 30(1) 149-158. Wesley, J. ( 1994). Effects of ability, high school achievement, and procrastinatory behavior on college performance. Educational and Psychological Measurement, 54, 404-408.